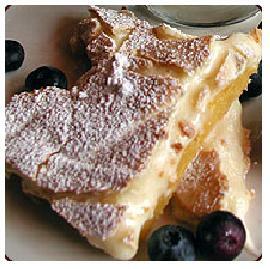 The Gooey Butter Cake Recipe is a popular favorite in St. Louis, Missouri. Scroll down to learn how to make a creamy, authentic St. Louis Gooey Butter Cake the easy way, using just a few simple ingredients. In large bowl, mix sugar, shortening and salt until light and fluffy. Add egg and beat well 1 minute until well blended. In a separate dish, dissolve the yeast in the warm milk. Add the flour, then the milk-yeast mixture and vanilla to the sugar mixture. Mix well for 3 minutes. (Use dough hook if possible). Turn dough onto lightly floured board and knead for 1 minute. Place dough in a lightly greased bowl and cover with a towel. Set in a warm place to rise for 1 hour. Press or roll dough into a circle about the size of the cake pan. Transfer dough to the pan and pat dough up the sides of the pan so the gooey butter doesn't run underneath. Prick dough a few times with a fork to keep from bubbling up during baking. In large bowl, combine sugar, butter and salt. Add egg and corn syrup. Mix enough to blend well. Add the flour, water and vanilla, mixing well. Spread gooey mixture over dough in the pan. While cake is standing, preheat oven to 375 degrees F (190 C). Bake cake for about 15 minutes, or until topping starts to turn golden. Do not over bake or the topping will not be gooey. Serve at room temperature and refrigerate leftovers. Authentic American Recipes from every state. Another Free Printable Recipe Collection.